Chapter 3 Page 22 is up. Father Winter sends Snow-by-Night forth on her quest to find her heart. This weekend, I’m off to DDXP where I’m going to talk to the designers of the next generation of D&D. It should be a frabjous time (callooh, callay!) I’ve asked Diane to sub for me on Friday. That means no Almanac entry this week. Instead, Diane will be making some additions to the web page. In other convention news. Snow by Night will be attending VA Comicon. We’ve also applied to Pittsburgh Comicon, Animazement, HeroesCon, and Small Press Expo. I’ll let you know when we get confirmed for those conventions. And finally, the vote incentive! With page 23, we return to the current day. 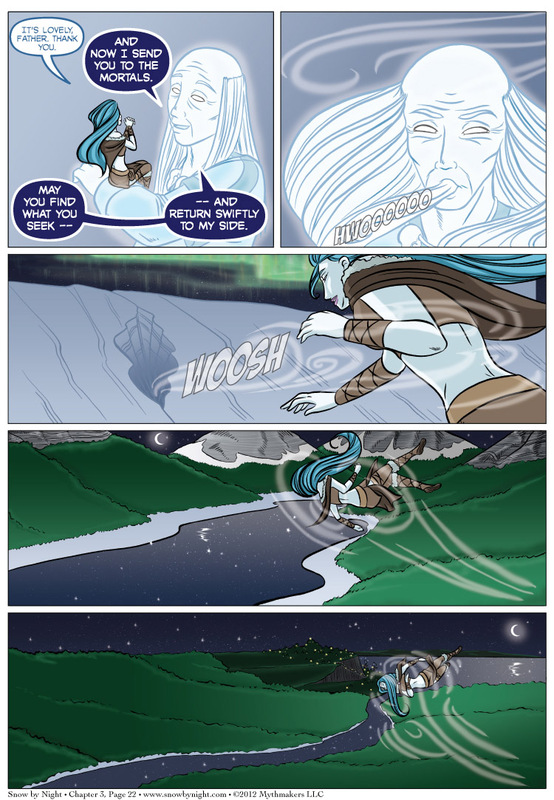 See Blaise and Jassart’s initial reaction to Snow-by-Night’s story, vote for Snow by Night on Top Web Comics.